6.1 Effective Megapixel Nikon DX Format CCD: Optimized to deliver a wide dynamic range that produces great pictures with high resolution and sharp details, the DX Format CCD sensor's 6.1 effective megapixels yield 3,008 x 2,000-pixel images that are suitable for making large prints, or for creative cropping to bring out detail. Near-Instant Power-Up in 0.2 Seconds: Turn the D70s on and with a power-up time of a mere 0.2 seconds, it’s ready to shoot. Pictures are processed and recorded extremely quickly. Preview images appear on the LCD monitor almost instantly. 7 Digital Vari-Programs: Digital Vari-Program selections automatically optimizes white balance, sharpening, tone (contrast), color, saturation and hue settings to best match the selected scene, making creative photography as simple as rotating the mode dial. Choose from Auto, Portrait, Landscape, Close Up, Sports, Night Landscape, or Night Portrait for automated performance that makes the Nikon D70s the right choice, whether you are still learning how to make great pictures or an experienced photographer simply in a hurry to capture precious moments. New Large 2.0 inch TFT LCD Monitor: Playback options on the new 2.0-inch LCD monitor include single frame, 4 or 9-image thumbnail display, zoom with scroll (up to 4.7x), automatic slide show, histogram indication and highlight point display. 3D Color Matrix Metering: The 1,005-pixel RGB Exposure/Color Matrix Metering Sensor evaluates brightness, color, contrast, selected focus area, and subject-to-camera distance information, references the results against an onboard database of 30,000 scenes from actual photography, then uses high-speed processing to deliver consistently dependable automatic exposures. Refined 5-Area AF System - with NEW All-Area Search: Nikons advanced 5-area Multi-CAM900 autofocus system continues to feature a cross-type sensor in the center, broad frame coverage, as well as the same class-leading low light detection and convenient AF-assist illuminator that aid shooting in dark situations. 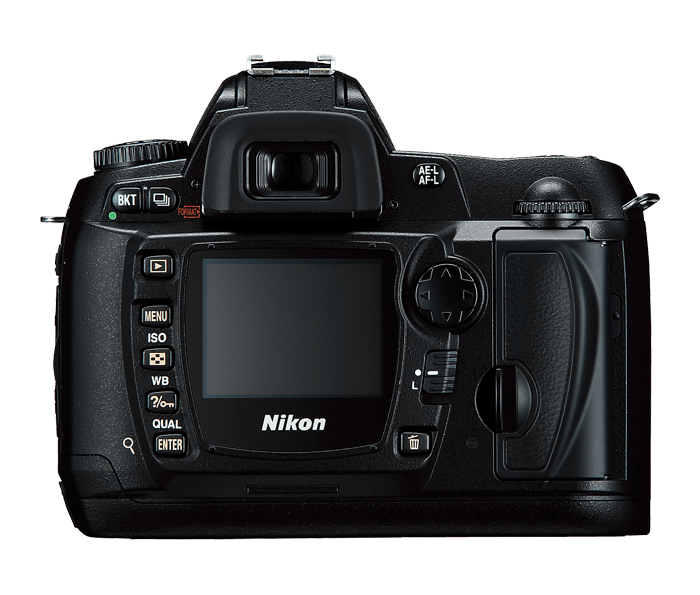 New for the Nikon D70s are refinements to deliver greater precision with fast, more consistent subject acquisition and improved focus tracking when using Closest Subject Priority Dynamic AF or Dynamic AF mode with predictive focus tracking and Lock-on (TM). iTTL and Nikon's Creative Lighting System : Makes taking pictures with flash as easy as turning the flash on! Easy multiple flash lighting is possible using the new Nikon Creative Lighting System including the SB-800 and SB-600 Speedlights. Wider Coverage from Built-In Speedlight to 18mm: The built-in Speedlight automatically pops up and fires when natural lighting is inadequate, or to add Balanced Fill-Flash when there is strong backlighting. A new, optimized design for the Nikon D70s increases flash coverage to support lenses as wide as 18mm. Fast - 1/8000 sec. Maximum Shutter Speed & 1/500 Sec. Flash Sync: Shutter speeds from 30 to 1/8,000 sec. and flash-synchronized shutter speeds of up to 1/500 sec. provide a photo experience with greater breadth and creative flexibility to catch more of those important picture moments. Enhanced Menu Display, Now Easier to Read: A new menu design combining a carefully selected color scheme, the right amount of contrast, and larger fonts makes the user-friendly keywords of the menu displays easier to view and quicker to recognize. Nikkor lenses: The D70s employs the Nikon F lens mount for seamless compatibility with the comprehensive lineup of high-quality AF and AF- S Nikkor lenses long favored by professionals around the world for their superb color, high contrast and razor-sharp images, as well as for outstanding autofocus. The increasing family of DX Nikkor lenses designed for use with Nikon digital SLR cameras make the options even richer, delivering a wider variety of picture angles, higher performance, and outstanding center-to-edge -to-corner image quality. PictureProject Software INCLUDED: PictureProject is refined with an intuitive new user interface that makes image management, editing and sharing easier and more fun. Simply connect the camera to a computer to automatically import pictures. Quickly e-mail or Auto Enhance images, run slideshows, burn CD/DVDs*, and access other commonly used functions via practical buttons. Use drag-and-drop to organize pictures into separate collections, and quickly locate any file by name, keyword, or date. NikonCapture Software (Optional): Nikon Capture 4 offers a unique image-editing environment and is the only program that provides complete functionality to edit NEF (Nikon Electronic Format) files, enabling photographers to optimize output for every possible need. *Configurations available at individual retailers may vary. AI-P NIKKOR: All Functions Supported Except 3D Color Matrix Metering, i- TTL Balanced Fill-Flash for Digital SLR and Autofocus Supported. Micro NIKKOR 85 mm f/2.8D:All Functions Supported Except Autofocus and Some Exposure Modes. Non-CPU: Can be used in mode M, but Exposure Meter does not Function; Electronic Rangefinder can be used if Maximum Aperture is f/5.6 or Faster. Other AF NIKKOR (Excluding lenses for F3AF): All Functions Supported Except 3D Color Matrix Metering and i-TTL Balanced Fill-Flash for Digital SLR.